Sycamore fig | Infonet Biovision Home. It naturally occurs from the Middle East west to Cape Verde Islands and south to South Africa, Namibia and the Comoro Islands. 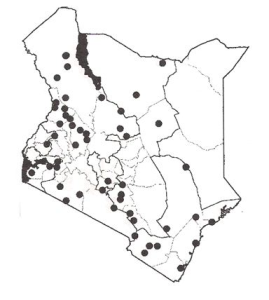 In Kenya, is widely distributed in riverine vegetation, on flood plains and places with high ground water. It is native to; Angola, Benin, Botswana, Burundi, Cameroon, Congo, Cote d'Ivoire, Democratic Republic of Congo, Djibouti, Egypt, Eritrea, Ethiopia, Gambia, Ghana, Guinea, Israel, Kenya, Lesotho, Madagascar, Mozambique, Namibia, Nigeria, Rwanda, Saudi Arabia, Senegal, Somalia, South Africa, Sudan, Swaziland, Syrian Arab Republic, Tanzania, Uganda, Zambia and Zimbabwe. Figs are fleshy, sweet and are eaten raw or cooked. They can be dried and have good flavor and high food value. They can also be eaten by livestock, birds and game. It is a sacred tree among many communities (Boran, Luo, Kikuyu, Kamba, Mbeere, Tharaka, Meru). Wood is light, pale and easy to work. Altitude: 0 - 2000 m, mean annual temperature: 0 - 40 deg. C, Mean annual rainfall: 500 - 1800 (max. 2200) mm, Soil type: Prefers deep, well-drained loam to clay soil rich in nutrients. Sandy soils with a shallow groundwater level may also be suitable. It flourishes in agro-ecological zones II - VII. Cuttings are used to propagate it. It is fairly fast growing and pruning, lopping may be employed to reduce shade when intercropped. In western Kenya bananas are often grown underneath it. Food: Mature fruits are eaten fresh, stewed, or dried and stored for later use. Fruit can also be used for the preparation of an alcoholic beverage. Leaves are used in soups and groundnut dishes. The bark is chewed together with kola nut. In Ghana, the wood ash is commonly used as a salt substitute. Fodder: Leaves are a much-sought fodder with fairly high nutritive value. Fruits are eaten by livestock, wild animals and birds. It is a valuable fodder in overstocked semi-arid areas where the trees occur naturally. Fuel: Can be used as firewood and for making charcoal; various peoples throughout Africa use a piece of dry wood from this tree as the base block when starting a fire by the friction method. Fibre: Inner part of the root used as weaving fibre, and a strong rope can be made from the inner bark. Timber: The wood is creamy brown, has a fairly uniform structure, is very light (air-dry 510 kg/m3), soft to moderately hard, tough, strong, easy to work, finishes smoothly and holds nails firmly. It is not very durable and is easily attacked by termites. Mainly used for making mortars and pestles, drums, stools, doors, beehives, dugout canoes, carvings and for house building. Medicine: The bark is used for the treatment of scrofula, coughs, and throat and chest diseases. The milky latex is used for treatment of dysentery and chest diseases, or is applied to inflamed areas, while ringworm is treated with the bark and milky latex. Leaves are said to be effective against jaundice and as an antidote for snakebite, while the roots have laxative and antihelmintic properties. 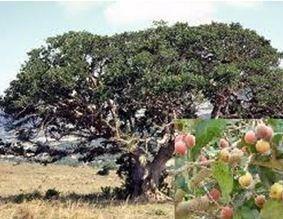 Erosion control: Wild fig can be used for sand-dune fixation and riverbank stabilization. Shade or shelter: The tree gives useful shade and is common at marketplaces, where people gather under it for many social functions. Soil improver: Shed leaves form a valuable litter improving the nutrient status, infiltration rate and water-holding capacity of the soil. Ornamental: An important tree planted for ornamental purposes near temples, roadsides, wells and community places such market centres in rural areas. The yellowish bark shows at an early stage, contrasting well with the green leaves. Intercropping: Usually intercropped with bananas as an understorey. Other services: The sycamore fig is widely valued for spiritual and sacred purposes. Such use can be traced back to ancient Egypt, and it is often mentioned in the Holy Bible. There is no information on the diseases and pests that affects it.